It’s the start of a new week which means another week of menu planning! If you are new to menu planning and aren’t sure where to get started, check out my recent post about how I menu plan here. If you are looking to cut back on your grocery expenses, be sure to check out my weekly list of sale/coupon match ups at Kroger, Giant Eagle, Target and Meijer here. 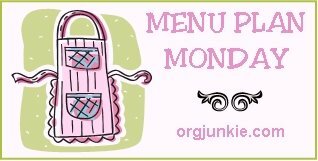 If you are in a meal planning rut and need some inspiration, be sure to check out tons of menu plans at I’m an Organizing Junkie! And if you haven’t already, be sure to check out $5 Dinners for lots of budget friendly recipes and ideas.